Day 179 – Chandler H.
Some of you might have heard that at the Worldwide Day of Giving celebration here in DC I did an impromptu fundraising effort to start raising money for those who have lost their jobs as a result of the BP oil spill. We raised $150. That is money that came straight from the pockets of those attending. Given that it was last-minute and the venue chose not to offer any type of matching or incentives for donating, we fell short of what I would have liked to raise. Although BP will pay lots of claims, there are lots of expenses and lost opportunities for Gulf residents that will never be repaid. Or won’t be repaid soon enough. I am empowering some amazing members of the Gulf community to distribute the money we raise to those who have been affected by the disaster. These amazing volunteers will then share the stories of people that they meet and help – very much in the same spirit as I have done my daily giving. Trust me I know, even $10 can make a difference. If you would like to help, click on the DONATE button to the right. 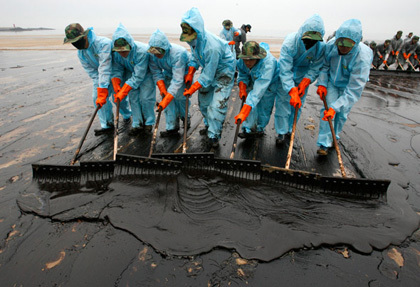 There is an interesting article in today’s Washington Post about grass-roots efforts to help those who have been affected by the oil spill. Day 179 was interesting. I went to a little lunch place near my old office that I used to frequent, House of Kabob (1829 M Street, NW). This place gets mixed reviews. Yes it’s a bit dirty. Yes it looks a little sketchy. And Yes the food is always tasty and the staff are incredibly friendly. Anyway, I noticed a man who was just raving about how much he liked the food there. He made a few comments to me and I kind of shook my head in agreement. I took my spice rubbed chicken, chickpeas, and rice over to a table to enjoy while reading the paper. He took his order to go. 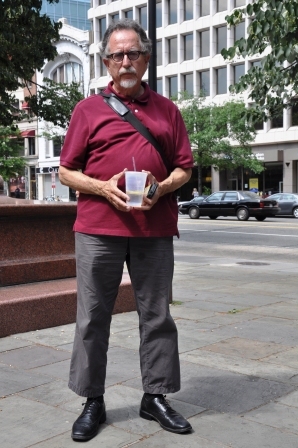 After my stomach was fully satisfied, I headed east on M Street and arrived at a tiny park where I saw the same gentleman that was raving about the food. He asked me how my lunch was. Not having anywhere to be, I stopped and spoke with him. Meet Chandler. Chandler is taller than me…which is not too tough, I am only 5’9”. He was wearing a red polo shirt buttoned all the way to the top, greyish green slacks, and black wingtips. I am not sure how old Chandler is. I asked him and he told me 47 and then said 67 and smiled and said why don’t you just guess. He asked me to ponder what my highest actions and/or characteristics are. Is it love, God, trust, success, honor? Whatever it is, I should write it all down. I think this is a very important exercise and I will do this. It reminds me of a conversation I had on Monday with a friend who I encouraged to write a business plan for his organization. It just helps to get it down on paper and commit to it. Chandler needed to leave. I am not sure what he did, but it was something in the legal field. We exchanged telephone numbers and email addresses and agreed to continue talking when he had more time. As for the $10, he said he was going to invest in gold. He left me with one other phrase that I really liked. “May the highest in you meet the highest in me.” He meant that we should be the very best and treat others the very best way we know how. I like that idea. I have reached out a couple of times via email but have not heard back from him. I have his telephone number and will have to try to set up time for us to speak further. Day 170 – Juan L.
It looks like there is a glitch with the website today. Instead of my usually banner of the open hand that is at the top, I have a nice picture of a foot bridge and some trees. Not sure why that is happening. Is anyone else seeing the footbridge picture instead of my normal banner? For those of you who will be participating in the Worldwide Day of Giving and sharing your stories with the world, you need to post them here. If you have photos and video to share, you will need to do one of two things. Either upload those on the Facebook page or write the stories here and put links to the photos/videos on a 3rd party website (such as YouTube or Flickr). Sorry to do it this way, but there are some technical challenges that prevent uploading the pictures and videos straight into this website. I am so excited to hear about your giving experiences! If you have some questions, check out the comments here that should help answer any questions you might have. So this morning I have an interview with DeLuca and the morning team at Q92, a Canton, OH based radio station. I have spoken to them before and had a good time with those guys. Later in the day I am talking with Tim Day of KG Country 99.5, a radio station in Red Deer, Alberta, Canada. I spoke with Tim about a month or so ago and he wanted to check in and see how things were going. Then I was thinking about going over to the ESPN Zone tonight. I heard that they are closing tomorrow for good! I have some game cards with like $100. Although there is no mention of them closing on their website, I did hear it on two different news programs. Anyway, I don’t think they are going to refund me the balance on the cards, so they need to get used. If anyone wants to meet up tonight and help me use the rest of the credits on my card, let me know! Today’s entry is a very special one. While I was in Manizales, I met with the Secretary of Education for Manizales, Dr. María Constanza Montoya Naranjo. She is a wonderful woman who is working hard to deliver the best education possible for the students in Manizales. One day we were talking about the Year of Giving and she suggested I give my $10 to the Mayor, Juan Manuel Llano Uribe. I had seen him on Friday at the event with US Ambassador William Brownfield. Anyway, she said she would give him a call and try to arrange something. Well what do you know? She arranged a meeting the next day! I get invited into a large conference room to wait for the Mayor. Already seated are four students and two teachers from a local school that had recently returned from a science fair in Dallas, TX. These students had built some robots that are prototypes for larger scale versions that would be used to help in the coffee production process and they were there to demonstrate their ingenuity to the Mayor. Well, how the hell am I going to follow that act? Anyway, the school children leave and I get a few minutes with the Mayor. He invites me to walk over to an adjacent room which turns out to be his office. It’s spacious with very nice views of Manizales. There are a couple of comfortable chairs arranged around a coffee table on one end. He disappears for a moment and then returns. We chat for a little while and I try to do my best to explain the Year of Giving. I am not sure what he thought of it, but he agreed to talk with me. He spoke about the growth and globalization of Manizales and the expected increase of tourism to the city. “What should a tourist be sure to see or do while they are here?” I asked. He said that one should definitely try to see the eight different shades of green that Manizales has. He was referring to the vast natural beauty and the stunning variety of greenery that exists there. I was certainly doing that by staying on Roberto Gonzalo’s plantation. He also mentioned that I should visit Nevado del Ruiz, a snow-covered volcanic peak that has been active in recent history. The current cone was formed about 150 years ago. Atop the mountain is a massive glacier. The Mayor says that this is the only peak of its kind that is accessible by car. That is impressive, not to mention that it’s at 5,135 meters, that’s more than 16,000 feet! Well, I didn’t make it there unfortunately, but next time! He stressed his commitment to making Manizales a bilingual community and that they were strongly behind the educational transformation that is needed to make this shift. There are two critical investment areas for this to be a success according to the Mayor: technology and human capital. “It’s sowing the seeds for the future,” he said. 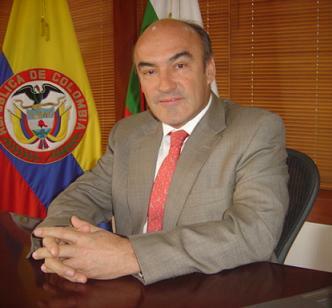 Here the Mayor speaks about his vision for Manizales (in Spanish). When the Mayor is not hard at work on the future of Manizales, he says that he enjoys playing golf and riding motorcycles. I wonder if he has taken his bike up to Nevado del Ruiz. That would be pretty spectacular! So what do you think the Mayor is going to do with the $10…or 20,000 pesos in this case? That was what was on my mind throughout the entire conversation. I circled back to the 20,000 peso note that sat in front of him and asked what he planned to do with it. I got an answer that I have never heard before. “I’m going to take your 20,000 pesos and give you 100,000 a year from now.” I am not sure exactly how he plans to do this and I didn’t ask. I just let it be. Mr. Mayor…I look forward to seeing you next June!